Our highly skilled team of dentists, hygienists and support staff provide the highest quality of dental care to thousands of people across the Northern Beaches and beyond. We have built a reputation as a centre of excellence, but more importantly a place where our patients feel welcome, comfortable and supported. All of our team complete regular further education and training, meaning our patient care is modern and in line with best practices. All our dentists are members of the Australian Dental Association (ADA) and our hygienists are members of the Dental Hygienists’ Association of Australia (DHAA). Alistair qualified as a Dentist at Bristol University, England, and has done further postgraduate study at Sydney University, completing the Graduate Diploma in Clinical Dentistry (Oral Implants). After spending 7 years working in private practice in London he moved to Australia in 2004 and made the Northern Beaches home, starting Mona Vale Dental in early 2009. Alistair is experienced in all areas of General Dentistry and is committed to ensuring that all patients get the highest possible care, individually tailored to your needs. Whether this means regular Active Maintenance or complex Restorative and Cosmetic work, Alistair’s attention to detail and gentle manner will mean that your visit will be a positive one. Alistair is highly qualified and experienced in the field of implant dentistry, and is one a few dentists qualified to be able to provide patients with both the surgical and restoring phases of the treatment. This means that patients do not need to be referred to another Specialist dentist for part of their treatment.He lectures in implant dentistry, and also children’s dentistry. He is a mentor to a number of colleagues. Outside of the Dental Surgery, Alistair spends his time competing in triathlons and is a member of Warringah Triathlon Club. Chase graduated from the University of Otago. Soon afterwards he moved to Sydney, gaining experience in private practice. He has a special interest in cosmetic dentistry, orthodontics and minor oral surgery. He believes that continuing education is vital to ensuring his patients receive the most contemporary and optimal dental care and is committed to ongoing postgraduate learning. Chase delivers high-quality patient-centered care and understands the importance of providing a comfortable relaxed experience. Outside of the dental surgery, Chase is a competitive rock climber and competes around the world in competitions. Dr John Wong graduated from the University of Sydney in 1979. He attained a Masters of Dental Surgery from University of Sydney in 1990. John is one the leading Oral Surgeon Specialists in Australia with many years of experience. He is a highly experienced Oral Surgeon in the field of wisdom teeth removal. Oral pathology, tissue biopsy, placement of dental implants and surgical management of cystic lesions are some of his professional interests. Treatments can be carried out at the practice under local anaesthesia, or a general anaesthetic can be arranged at a local day stay hospital. Kristin graduated from Sydney University with Bachelor of Oral Health degree and works as a Hygienist and Therapist at Mona Vale Dental. Her dual qualifications enable her to treat all aspects of children’s dentistry as well as her role as a Hygienist for adult patients. The role of the Hygienist to is run the Prevention and Maintenance side of the Practice, and Kristin does this with great care, attention to detail and the highest quality of clinical care. Kristin has worked at Mona Vale since 2010 and has become a vital member of the team. Previous to becoming a Hygienist, Kristin was a fully qualified Dental Technician. Baden grew up on the NSW Central Coast and has more than 17 years experience working as a Dental and Oral Health Therapist (OHT). He has worked in both the public and private sectors across numerous locations throughout New South Wales and the Northern Territory. Baden has also held the position of Clinical Supervisor with the University of Newcastle Oral Health Programs. Baden has held the positions of President of the Australian Dental and Oral Health Therapists Association NSW Branch (ADOHTA – NSW) and Treasurer of the Australian Dental and Oral Health Therapists Association (ADOHTA). Baden has a strong passion for paediatric, special needs and preventive dentistry. Outside of dentistry Baden enjoys being a dad, cooking, Rugby Union and Rugby League. Patricia graduated from the University of Sydney, and holds special interests in children’s dentistry, and is passionate about educating her patients on how to take care of their oral health. She also places a strong emphasis on preventive care and how this can help prevent oral diseases through good oral hygiene. Committed to furthering her professional development, Patricia is completing additional studies in extended scope – dental therapy. She is a member of the Dental Hygienists Association of Australia and the Australian Dental and Oral Health Therapist Association. Away from the Practice, Patricia spends her free time exercising, baking and Zumba dancing. Lisa came to Mona Vale Dental after a career in the Travel Industry and quickly established herself as a vital member of the team. She is always available to help with any questions, and her kind, organised personality will mean that you feel happy and welcome at the Practice. Lisa has completed Certificate III in Dental Assisting. Cathy oversees the co-ordination between treatments and front office to ensure that your treatment plan is as seamless as possible. Having worked previously as a registered nurse and clinic co-ordinator for a large health fund practice, Cathy has the experience and expertise to look after our patients with the highest level of care. A highly skilled Dental Assistant, Lauren understands how to make you comfortable during your visit. Her caring, confident and empathetic nature endears her to our regulars. 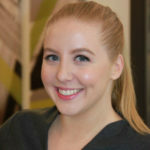 Lauren has worked previously in a leading North Shore dental practice before moving to the Northern Beaches and joining the team at Mona Vale Dental. With a warm and engaging personality, attention to detail and professionalism, Brittany assists our patients in the treatment rooms and helps deliver the highest level of care.